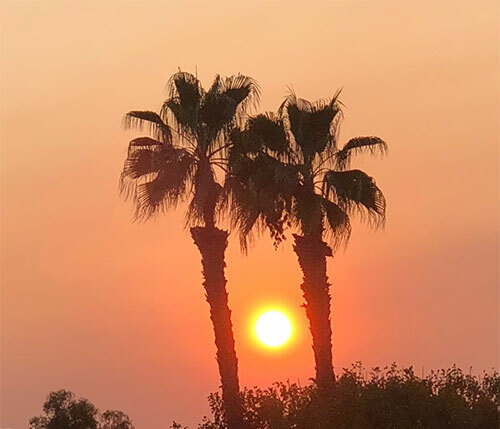 So first up, is this image of the sun just going down between two palm trees and the sky pretty much full of dust and smoke. Might have to wait a couple of days for the winds to get milder. In the last several posts we have been following the path of young stars and the collapsing disk that eventually might have planet formation. There is a lot of physics going on as a cloud of gas collapses to form the protoplanetary disk and new star. One of the factors influencing the formation of planets is feedback effects from the young sun. The young sun system relies on these and other factors to transfer angular momentum away from the central core to the outer parts of the disk and planets. One of the main feedbacks is the solar wind. 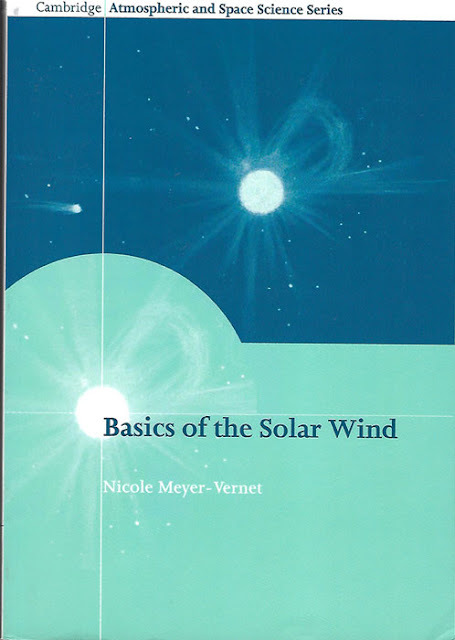 To get a better understanding of the solar wind, I can recommend this book. It fills in some of the gaps in describing planet formation outlined in other previously considered books. It is quite technical and you will find some tough mathematics, especially when getting an introduction to magneto hydrodynamics. Rather than go into the more technical aspects of the book let's consider just two interesting factoids. First, we can ask how much material is ejected from the sun and carried away as the solar wind. It turns out that about one billion kilograms per second of material, mostly made up of ionized hydrogen consisting of one proton and one electron from each hydrogen atom. This sounds like a lot, but the total amount ejected over the lifetime of the sun is only about 0.01% of the total solar mass. The second factoid tidbit is ask how much the sunlight emitted by the sun weighs in comparison to the solar wind. Hmm, we normally don't consider light as weighing anything or having any mass at all, but if you consider the mass equivalency with energy as described by the famous E = mc^2 equation, then the total amount of sunlight emitted by the sun is about four times as much, that is about 4 billion kilograms per second. RA = 04 31 40 and Dec = 18 13 57 with magnitude = 10.4. Hey, I should be able to find that in my back yard! Now, I had planned to search for XZ Tau while we were at the Nightfall event in Borrego Springs, but as you know and as described in the post of November 5, 2018, we were clouded out. So, now without the help of a tracking telescope, let's see if we can just get close to the star with just a DSLR and tripod. 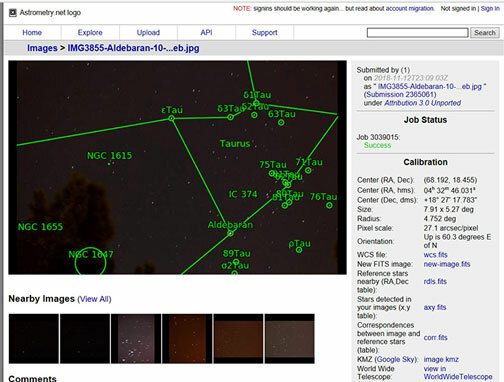 So, as shown in the Megastar screenshot below, the bright star Aldebaran, mag = 0.9, could be used as a signpost as to where to point the DSLR. The XZ Tau coordinates are at the center of the red circle and the camera field of view is shown as the yellow rectangle. The Alt and Az pointing angles were easily achievable. So, it seemed that we were on track to get close to XZ Tau. center was off the mark by many degrees. What had happened and what went wrong? Well after some head scratching it finally dawned on me that the placement of the camera field of view rectangle on the Megastar plot was arbitrary and did not reflect the actual needed position. 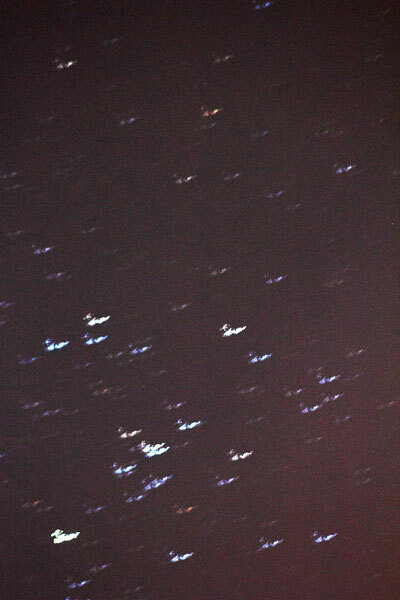 Yes, the position of Aldebaran was close, but one star does not pin down the correct positioning of the camera frame. Just consider the frame as being rotated about the location of Aldebaran. There is no way that I could know for sure which position angle was correct, just given one point. What was needed was one more point. So, in the Megastar screenshot below you can see the same general background stars but now the horizon is plotted as the blue line. Now, I can see how to position the camera frame. Note how the bottom of the camera rectangle field of view is arranged parallel with the horizon. 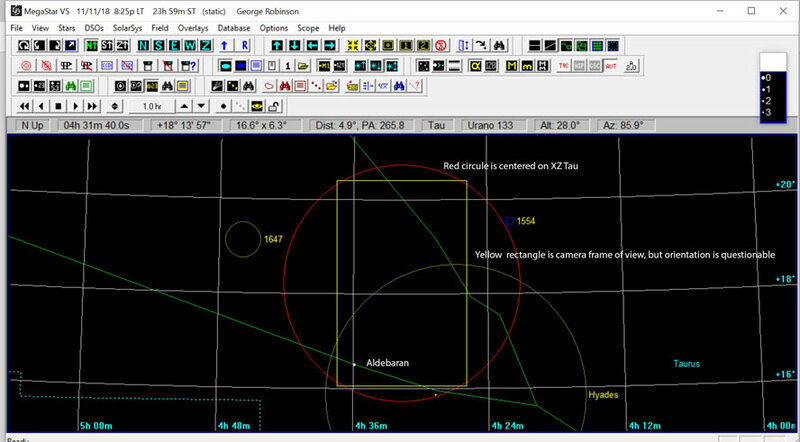 Now when the camera, using Aldebaran and the horizon, is pointed it should now point right at the center of the XZ Tau region of interest! 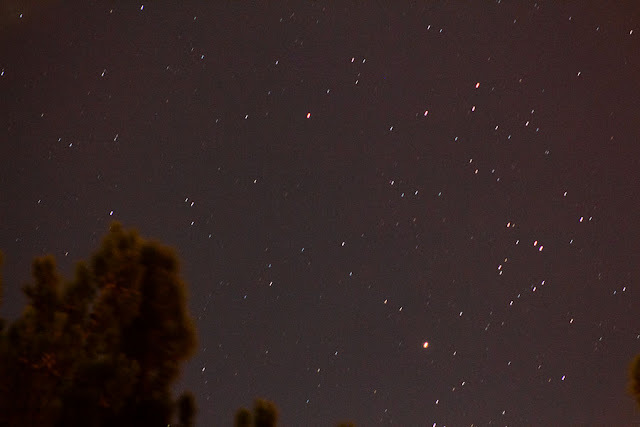 So, the image below has the bright star Aldebaran (bottom, right of center) and the region of interest is to the right of the background trees. 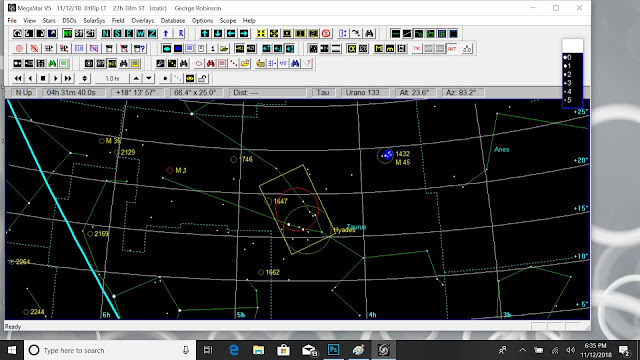 Now this time, using the astrometry services available at www.astrometry.net, the above image was uploaded and processes to get the actual RA and Dec of the image. The center of frame coordinates were found to be: RA = 04 32 46 and Dec = 18 27 17. which, given that the camera was just positioned by eyeball, are pretty close to the location of XZ Tau. 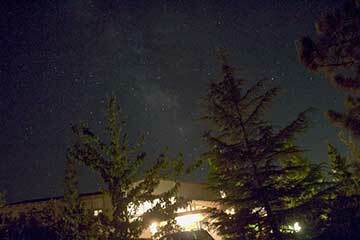 So, hooray, we can at least point the camera and get XZ Tau in the region of interest. Now this does not mean that actually measuring the magnitude of the variable star is going to be straightforward. There will still be a lot more work if I hope to develop the capability of making the magnitude measurement. But you have to start some where! At least now, if there is some discussion of X Tau at the AAVSO annual meeting, I will have at least tried to do some observations. Finally, we should mention one new observatory tool that is being evaluated and hope to use for northern light imaging aboard our artic circle cruise next year. 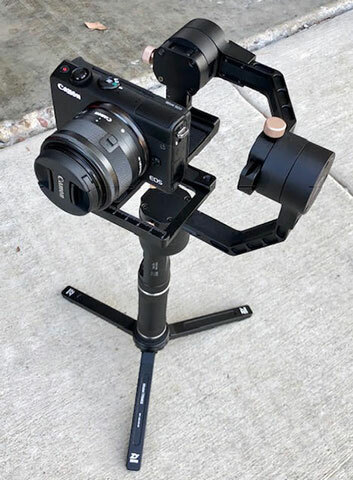 Check out this "Crane Plus" system made by Zhiyun. Trying to photograph ordinary astronomical targets like the Milky Way for instance or other dim objects like the Northern Lights, which requires long exposures, from a moving cruise ship, can be difficult. Check out the recent blog of September 8, 2018, for more discussion on that topic. Anyway, I am still checking this new tool out and trying to get it calibrated for the camera. So far, it seems to be ok, if not a bit unsteady for some axis motions, but in general it is quite impressive to watch the camera stay fixed in one direction while I went trough almost 180 degrees of motion. Having previously worked on gyro stabilized missile systems and how complicated and expensive they were, it is really neat to have a hand held camera stabilization tool. My test plan includes lining up the camera on some large constellation, like Orion, The Hunter, and compare two long exposure images: one with no motion at all, and the other one taken with me walking around and taking the image at the same time. Hopefully, the gyro stabilizer will compensate for any walking motion. Time will tell how effective it will really be!